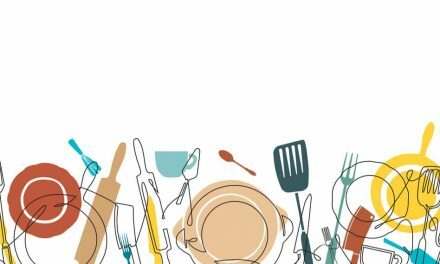 Having the right kitchen equipment can make a huge difference to anyone who is physically challenged and unable to handle heavy cookware. There is no need to worry, though, when pots and pans seem to heavy. There is always a solution! These are some of our favorite lightweight pans that are suitable for the elderly and the disabled. 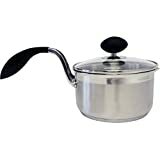 See also our ‘Lightweight saucepans for weak wrists” review article. Stainless steel pans have many advantages. They are non-reactive, durable, impact-resistant, and often dishwasher safe. However, stainless steel cookware can be quite heavy too. If you are looking for lightweight cookware, this can be a problem, but not with this Eazigrip saucepan. It is still the heaviest pan on our list, but at 2.3 pounds it’s quite manageable. Moreover, it is not just about the weight. The feature that makes Eazigrip pans stand out is the ergonomically designed handle. It really makes holding and balancing the pot many times easier. It’s also designed in such a way that you can literally do anything using only one hand. Thanks to the comfortable silicone grip on the handle, the pot will never slip, and the straining lid makes straining a breeze! Finally, this pot is compatible with all kinds of stovetops, dishwasher- safe, and oven-safe. What more could you ask for? Pans from the Hummington Collection by Gibson Home are quite sturdy, but also exceptionally lightweight. This 10-inch pan is made of aluminum with a ceramic non-stick coating on the inside. The aluminum ensures even heat distribution and fast heating while also keeping the pan light. On the other hand, the ceramic non-stick coating doesn’t contain any harmful chemicals and makes healthy cooking much easier. The handle is made of bakelite so it remains cold on the stovetop. It’s quite wide and comfortable so handling this pan shouldn’t be a problem for anyone. This ceramic-coated non-stick frying pan from Concord is lightweight and comfortable to hold. As most of the lightweight pans on our list, it is made of aluminum with a non-stick coating. 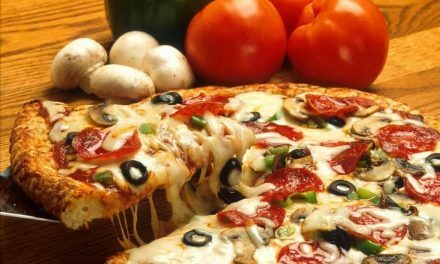 No harmful chemicals are used in this coating though, so there is no need to worry about the safety of your food. The beautiful red exterior gives this pan a retro look while the white interior lets you keep track of your cooking. Most importantly, this pan comes with a silicone handle which is heat-resistant, slip-resistant and provides a secure grip. If you are looking for an affordable lightweight pan that will do its job well, this might be the one. This beautiful pan set from GreenLife is one of the lightest on our list. The set has two pans 7 inches and 10 inches wide, which is a great size. Having a pair of frying pans gives plenty of options depending on the size of the ingredients or how many people you are serving. The GreenLife Soft Grip Ceramic Non-Stick 7″ and 10″ Open Frypan Set has an aluminum body which allows it to be so light. 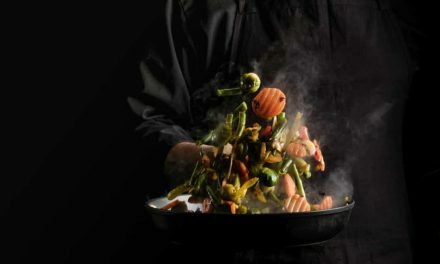 However, what makes it stand out among others is the attention GreenLife puts into their non-stick coating. The coating they use is a ceramic non-stick solution that is completely safe to use. Their coating is called Thermolon and GreenLife was actually the first company to introduce such coating. Besides being safe, this coating is super easy to clean and able to withstand moderately high temperatures. This pan is even oven-safe up to 350 degrees Fahrenheit and you it’s dishwasher-safe which is not always the case with non-stick cookware. GreenLife cookware also makes a wonderful gift since you can choose between three delightful colors – turquoise, burgundy, and classic black. See our ceramic cookware set reviews here. See our review of the GreenLife Cookware Collections here. 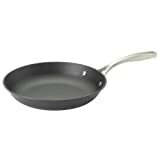 This fry pan is constructed of durable cast iron coated in enamel, which provides the best attributes of traditional cast iron, but at 50% less weight. It will absorb heat evenly and spread it gently, for excellent heat retention without hot spots while cooking. Features a pre-seasoned interior suitable for browning and searing, while the porcelain enameled exterior allows for fast, easy clean up. Oven safe up to 400 degrees F and compatible with all heat sources including gas, electric, induction and ceramic top ranges. Who said cast iron needs to be heavy? This 12-inch pan from Guy Fieri combines the best features of cast iron with lightness! It is actually made of a combination of cast iron and porcelain enamel and it weighs 2 pounds total. What we love most about this pan is that it really does feel like cast iron. It provides even heating without hotspots and it absorbs and retains heat quite well. The inside is pre-seasoned, so there is nothing to worry about there. You can use the pan for searing and browning right out of the box! It is also compatible with induction stoves. The only slight downside is that you can’t wash it in the dishwasher. The Copper Chef 10 Inch Round Frying Pan is definitely the most beautiful pan on this list. However, it’s not only good-looking, but it’s also one of the lightest pans you can find, weight only 1 pound. You really can’t go much lighter than that with a full-sized 10-inch pan. It’s an aluminum-core pan with a non-stick coating, and it’s also one of the sturdiest pans of this kind we could find. 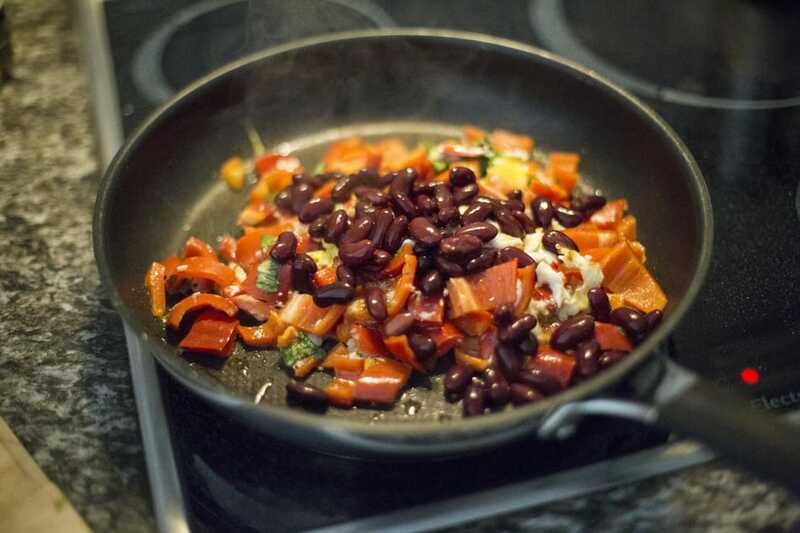 Furthermore, unlike some other non-stick coatings, the coating on this pan is highly heat-resistant since it can stand temperatures up to 850 degrees Fahrenheit. Since the pan is also oven-safe, the cooking flexibility you get is unlimited. It also includes a glass lid for safer and more convenient cooking. The only slight downside is the handle – which is made of metal and might get hot on the stovetop. However, this problem is easily solvable with a silicone handle cover. When looking for a lightweight pan, the material makes all the difference in the world. In this regard, aluminum pans with non-stick coating are generally the lightest and the best choice. However, it’s also possible to find pans from different materials that are designed specifically to put less strain to the wrist and hands, like the Eazigrip 2355 1.5-Qt. Stainless Steel Non Stick Covered Saucepan with Lid. On that note, it’s also important to look for larger handles that provide a secure grip.